The safety of our employees is our number one priority and this is reflected in the way our senior management team takes personal responsibility for individual sites. Our ongoing Stop, Think, Work Safely campaign keeps health and safety at the forefront of people’s minds. In 2016, Frontier continued its focus on reducing accidents. Employees are actively encouraged to report ‘Near-Miss Incidents’ and site audits demonstrated a further improvement in average scores. 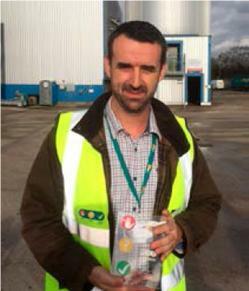 In November, Phil Durham, an IT helpdesk operator at our Sandy office, won our annual Health and Safety award for his tireless efforts to promote our health and safety culture both in his own role and in the wider business.